This kit is part of the ‘US Aggressors groupbuild’. Construction went on quite straightforward although there are some problems here and there. Nothing that putty couldn’t fix though. One particularly annoying part is that I have to putty off the holes under the wings meant for underwing stores. Obviously if I was bulding a normal F-16 loaded with a ton of weapons I wouldn’t be bitching. As per normal with aircraft kits, the cockpit has to be painted first before further construction could be done. It’s simple matter of grey for the whole cockpit tub, black for the control panels, green for the MFD screens and some drybrushing to bring out the detail of the control surfaces. I decided that with the F-16’s huge canopy, I needed the ejection seat to be more detailed than what came in the box. So I got hold of a pair of ACES II resin seats from Legends Productions, a Korean resin kit manufacturer. The resin seat comes with molded-on seat belts and is generally much more detailed than the default kit seat. I colored the seat based on references I got from The Ejection Site. A simple wash with diluted black color and some minor drybrushing is all I need to add depth and bring out the fine details of the seat. I tried out a new method of filling the gaps: liquid paper aka correction fluid. This was suggested by a good friend G-Man from the Plamo Forums. Applying is easy: just whack on a dollup onto the gap. Then I ran a cotton bud with Gunze thinner through it, which thins and softens the liquid paper and makes it flow flush. So it works, I’m just now sure how it will look after priming. We’ll see. I also added all the major not too fragile parts onto the kit, so I can paint in one shot. I guess in this sense, aircraft kits are actually easier to paint than mecha kits. So anyway, all the tiny sensor bumps and blades are added. Next came the RWR sensors on the wings. These are the major parts that are missing from the kit which is too bad since they are quite obvious on the real aircraft. A bit of a challenge to scratchbuild them since the RWR sensors have an odd shape. They are pretty small so I decided to just make a general likeness hehe. So the only update here is a small old one. The canopy had a big seamline running down the middle so I scraped it off with a hobby knife and slowly sanded the area with ever finer sandpaper, ending with 400 grit. Then I dipped the canopy into Future floor polish to give it a supershine. To top it off, I carefully masked the canopy with Tamiya masking tape. To attach to the kit, I would use white glue as it dries transparent. Here are the spots I found on top of the kit that need further fixing. The good news in all this is that the RWR sensors turned out very nice and I don’t have to make any further changes to them. Score! The PGM-79 Powered GM variant of the RGM-79C was developed by the Federation R&D division as a testbed for an enhanced backpack that provided very powerful thrust and acceleration. With this enhancement, the legs were mounted with improved shocked absorbers. Outwardly, the PGM-79 looks to be more heavily armored than the standard RGM-79C. However, that is not the case as the bulkiness was mainly due to the mounting of the backpack control systems and further improvements to the structure of the RGM-79C frame. At least 3 units were tested with this modification in the Torrington base facility in Australia in UC 0083. The Powered GM is my favorite GM variant from the Gundam universe, so needless to say, it is also the first ever Master Grade Gundam kit I did. This was also to be my first ever kit that I have extensively modified in addition to a kitbash with an aftermarket set of parts. In this case, it’s a conversion set from Akohobby. All in all, a very satisfying job. The GAT-X105 Strike Gundam was one of five experimental Mobile Suits developed by the OMNI Alliance to counter the mobile suits deployed by the ZAFT faction. It is the most versatile among the five units as it was given the ‘flexibility’ to be upgraded with weapons packs : Aile, Launcher and Sword. The Aile (‘Air’ in French) pack adds additional mobility in space to the Strike Gundam as well as flight capabilities on Earth. Weapons-wise, however, the Aile only adds two beam sabers to the Strike’s standard equipment list. Mobile Suit Gundam SEED just happens to be one of the first Gundam TV series that I’ve followed closely (I know the Gundam universe fairly well, but I haven’t seen stuff like Z Gundam, ZZ Gundam et al). I’m not much of Okawara’s fan when it comes to Gundam designs but on the whole, I do like his designs for Gundam SEED, with the Strike Gundam being my favorite. 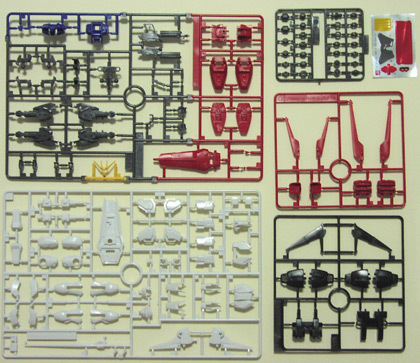 This is the more complicated version of two 1/144 kits that are available in the mass-market. The HG series of Gundam SEED is equivalent to the HGUC Gundam series. Therefore, there are: covered joints, clear parts (wellâ€¦ in some of them anyway, not this kit), color-coordinated parts and ball joints. The Strike comes only with the Aile pack (you can use the Launcher and the Sword packs available in the No-Grade Strike Gundam kit if you want to arm your HG Strike although modifications are needed). Because of the way the MS is designed and the way the parts are broken down, the kit’s legs will require a bit of planning to make the eventual painting of the kit easy. This involves a simple cut to the leg to separate the parts. Unlike most HGUC kits, this kit will require a fair bit of prep work due to a number of fairly obvious seamlines. Construction looks to be fairly straightforward and based on the box photos, it will be a pretty poseable kit too. Quite remarkable considering the scale. While I would have preferred that they provided clear beam sabers, I tend to not display my kits with beam sabers anyway so this is a minor point to quibble about. Like the HGUC series, the fists are oversized for the scale and unless one buys the expensive resin hands or scratchbuilds a set, there’s nothing much that can be done. Proportions-wise, this is in my opinion, the best looking (in my opinion anyway) Strike Gundam kit in the market right now. It even looks better than the MG version I think. The 1/100 scaled Strikes suffer from having big hips. This is probably because of the fact that they are compartments for the Strike’s daggers (officially called ‘Armor Schneider combat knives’ but I call them as I see them). The HG doesn’t have the compartments so the hips are much thinner and streamlined. Other design elements also make it one of the better renditions of the Strike in the market â€“ smaller feet and less bulky shoulders. As usual, Bandai includes a set of stickers instead of water-slide decals for this kit. Seeing as how the Strike is supposed to be devoid of markings, this is not really a big deal. All in all, another nice little kit from Bandai. Their 1/144 scale kits are getting better engineered now and that’s good news for everyone.